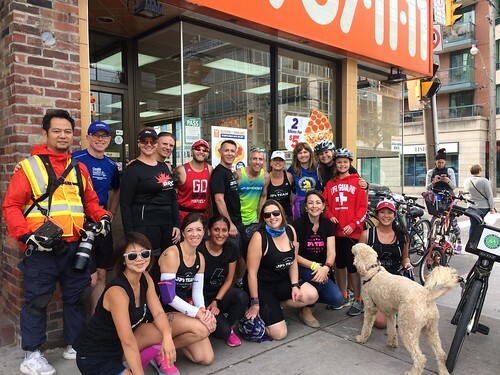 This is the second part of my 2017 Scotiabank Toronto Waterfront half Marathon (STWM) race recap. Check out part one here. 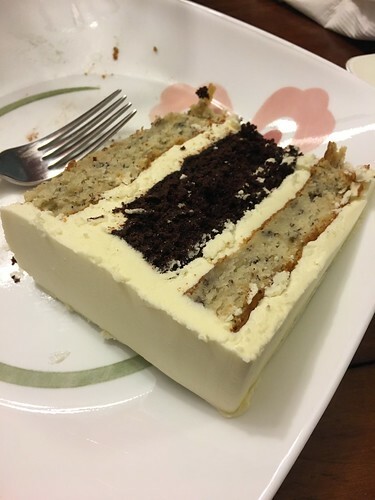 Dan and I started Saturday morning bright and early at around 4 a.m. Dan had been talking to somebody about weddings, which made him think of our wedding cake and led him to ordering some wedding cake. You read that right, he ordered our wedding cake (a smaller version). 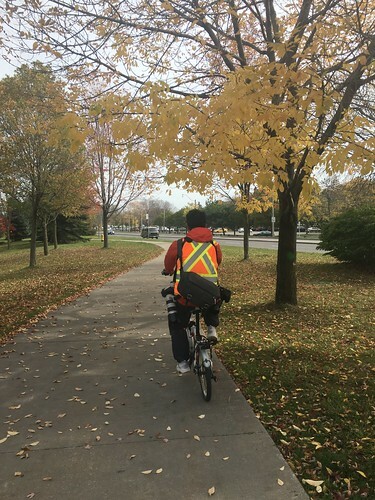 He gave half of it away and we had just enough to snack on every morning before joining JP for the kilometres up and down Bayview Avenue. We were powered on wedding cake. Our friends Lisa and Karen K. got up even earlier and had already been running for an hour with JP by the time we got up. They were superstars and ended up running 20k with him, which was more than what they had initially planned! Meanwhile, the Holman family got up early and drove in to join him for parts of his run. Dan and I stood on our usual corner to run with him from the 22k to the 26k point. First we saw Mary-Anne and Rosie drive by in the support van (they stopped to say hi and take some pictures). Then we saw Edison on his bike. He stopped and we hugged him. After that we joined JP and three other runners and headed toward Bayview Avenue. His running was strong and he seemed to have recovered from marathon #2 (the tough second marathon the day before). It seemed chillier today than the day before and JP told us how he had learned that it’s usually the coldest right before the sun rises. We all started pondering why this was, with theories ranging from changes in the tide to magnetic poles. I’ve googled it since then and it turns out that the ground radiates heat from the sunlight. This heat rises and heats the air, which means that the air and ground are cooling down from the moment the sun sets. This is why it’s typically cooler right before the sun rises again (this is what Dr. Google told me anyway!). During marathon #1 we had seen a skunk. As we approached Bayview Avenue on marathon #3 we could smell the skunk. I prayed that we wouldn’t get sprayed by the skunk. 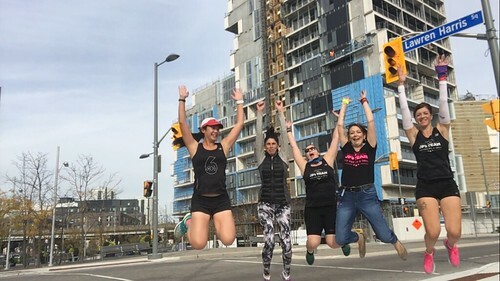 Once again, we ran up and down Bayview Avenue and before we knew it, the stretch was over. Fortunately it was another skunk-free run. We said goodbye (for now) to JP and Carol (one of the runners) as they continued east while the rest of us were done for this marathon. Melly, Cliff and I had originally planned to run the last 4k of JP’s fourth marathon and help run him in. Based on his schedule, we planned to meet at the 38k mark at around 11:45 a.m. Of course things don’t always go according to plan. 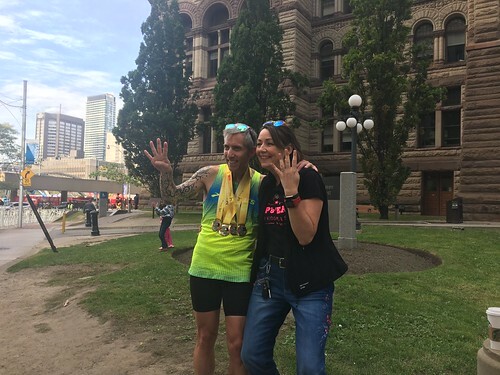 Melly and Cliff were headed to the 38k mark when Melly talked to Mary-Anne to find out where they were. It turns out things were running behind schedule, so she advised them to join him shortly before Bayview Ave. and run that stretch with him instead. They went to join him and Melly later told me that she had to sprint to keep up with him! I met Melly, Leanne (on her bike. 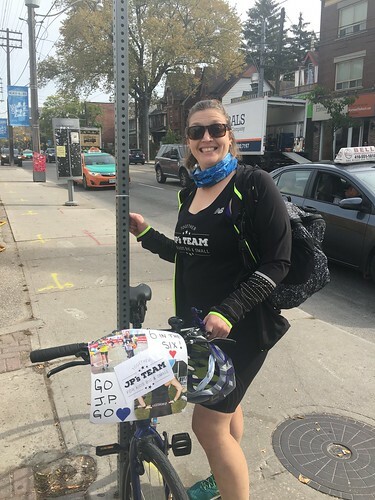 She biked the entire fourth marathon! ), Mary-Anne etc. at the square by Bayview Avenue while everybody else ran that out and back section. We took a few jumping pictures while we waited (none of them really turned out). 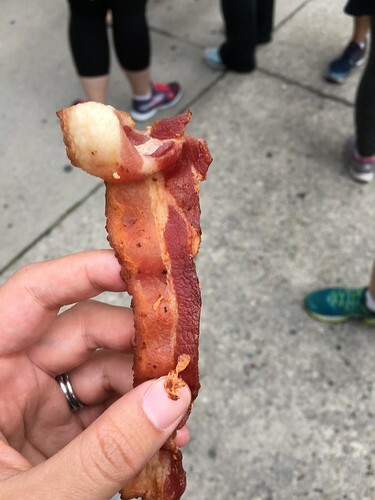 Leanne brought bacon! It was amazing! Michelle also found us. She came in from North York to run with JP. Then we devised a plan. 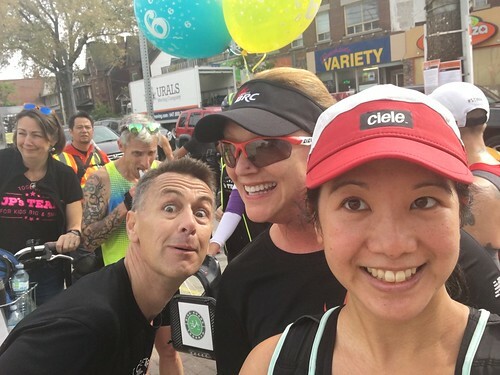 Melly was going to rent a Bixi Bike (to keep her from running too much, since STWM was going to be her first half marathon since an injury at STWM 2016) while I continued to run and we would finish the last half-ish with him. Cliff, Dan and JP after completing the Bayview Avenue section. Again, things didn’t quite go according to plan. Melly successfully rented the bike, but when she punched in the code and tried to get it out of the bike lock, it wouldn’t release. She ended up having to call customer service and they eventually helped her get her bike. At this point, we had lost the others, but since we knew the route we figured we’d catch up. 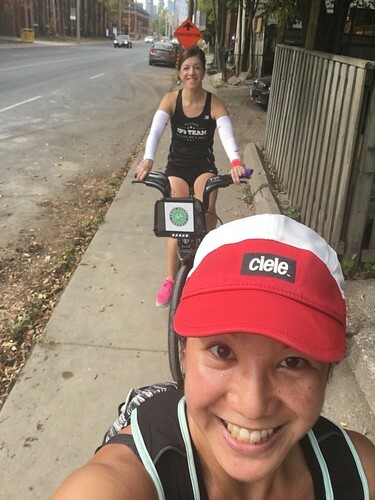 As I ran and Melly rode beside me, I joked that for the next little while, Melly was my sherpa. That time Melly was my sherpa. After some more pictures, the group continued across Queen to Beech where the turnaround is. I stayed with Mary-Anne and Leanne, since I wasn’t planning on running as much. 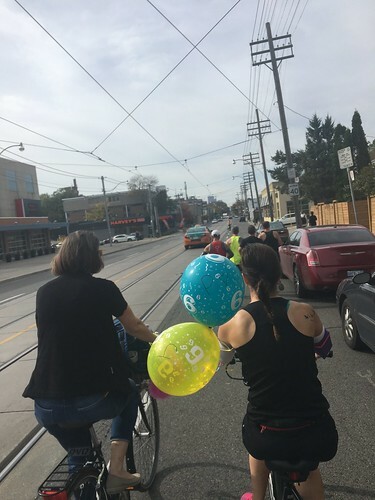 JP and everybody returned with balloons (attached to Melly’s bike. The balloons were from Sam!) and Karen was running with them too. We took a few selfies and I hugged her goodbye before we started running again. Considering JP was running his fourth marathon of the weekend, he was running really strong. It was also a faster pace than I anticipated, but I felt pretty good so I managed to keep with the group a few metres back. Farah was also running with him so we got to chat a bit. She had just run the Chicago Marathon two weeks before. This run was a cool experience for me. Since the sidewalks were busy with pedestrians we ended up running and biking on the road. I’ve never run with such a big group on the road before (outside of a race). We did stop for some walk breaks along the way. Each break ended with JP yelling “Forward!” and everybody running again. As we got closer to the finish, I ended up running with a man named B (I think his name was Bill, Brian or Bob. I can’t remember which one). He told me that he had been out cheering during the first half of JP’s run and then ended up joining in. I thought that was pretty cool. As we were talking, JP was picking up speed. We crossed many intersections where the light was about to change, and since B and I were at the back, we had to sprint to make each light. 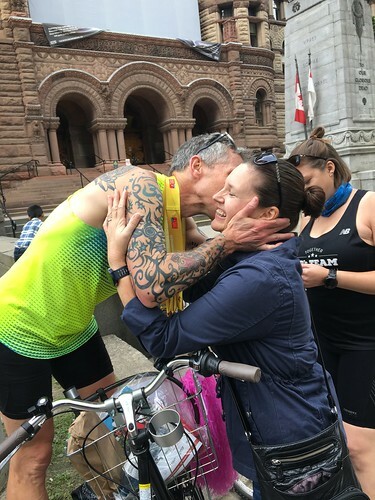 As we headed up Bay Street, B commented about finishing strong, so we both picked up the pace to try to keep up with JP, Cliff and another runner. They were running so fast, that I could barely stay within a few metres of them. I didn’t make the light at the last intersection, so I watched them finished and then waited for the light to change so that I could join them. There was a group of JP’s Team members gathered to watch him finish. As they were hugging him a woman ran up and asked if she had missed it. It was Canadian elite marathon runner Rachel Hannah! How cool is that? 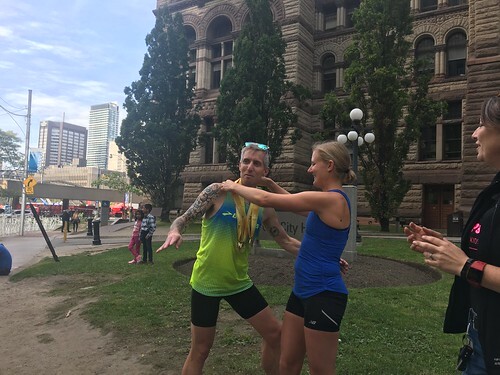 Since she was there, she helped present JP with his four marathon medals. Then we took some pictures and went for coffee. Stay tuned for my race recap in part three!